An other publication of the Asset Standards Authority (ASA), an independent unit established within Transport for NSW of Australia. This manual provides guidelines for the identification of rail surface defects during track inspections. 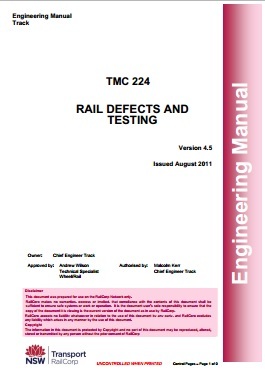 The manual is part of RailCorp’s engineering standards and procedures publications. More specifically, it is part of the Civil Engineering suite that comprises standards, installation and maintenance manuals and specifications. Manuals contain requirements, process and guidelines for the management of civil assets and for carrying out examination, construction, installation and maintenance activities. An other interesting publication of the Asset Standards Authority (ASA), an independent unit established within Transport for NSW of Australia. This manual provides requirements, processes and guidelines for the testing of rail for internal defects and for the acceptance testing of rail welds and weld repairs. The manual is part of RailCorp’s engineering standards and procedures publications. More specifically, it is part of the Civil Engineering suite that comprises standards, installation and maintenance manuals and specifications. Manuals contain requirements, process and guidelines for the management of track assets and for carrying out examination, construction, installation and maintenance activities. An interesting publication of the Asset Standards Authority (ASA), an independent unit established within Transport for NSW of Australia. 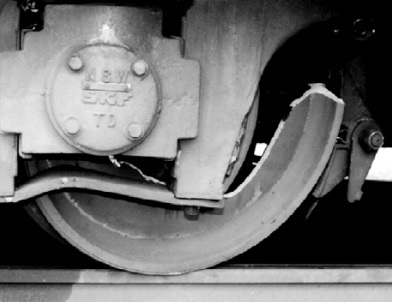 Wheels with defective wheels may cause damage to both the track and the vehicle or lead to derailment. This Wheel Defect Manual provides staff with a summary of wheel conditions under which wheels may continue in service and operating restrictions imposed for defective wheels found on vehicles operating on the RailCorp network. The occurrence of rail defects has generally increased because of the much longer rail lives obtained through various improvements, which have reduced the rail wear and hence have allowed the defects to develop. The main purpose of this Handbook is to describe some of the more common rail defects, their causes, and the possible ways of controlling their development. 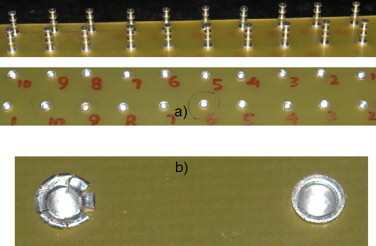 A interesting paper in « International Journal of Advance Engineering and Research Development » (IJAERD) published on ijaerd.co.in. The main goals of this project were the development of the body for an electric vehicle and the study of the front fender. Various aspects related with the project of a fiberglass component were addressed in this work like the choice of materials, and manufacturing processes of composite materials. In order to test the front fender, this was modeled seperatly and imported to ANSYS classic. A model with solid elements and a tailored mesh was developed, having one element per ply in the through the thickness direction and accounting for aspects like contact and laminate layup. Failure analysis was made by a progressive damage model with a set of Hashin type failure criteria. A paper published in « PCO Proceeding 2013 based on AIP Guide« . Abstract. 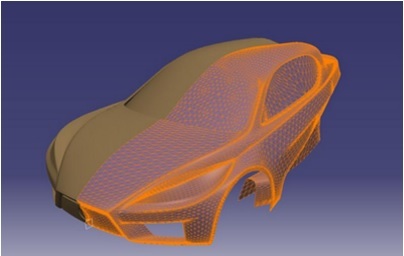 Traditionally, the durability performance of vehicle components and subsystem has been investigated and verified by testing physical prototypes. In this study, we performed durability analysis of the knuckle arm. 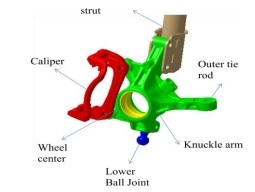 In this study, the stiffness and durability of the knuckle installed in a small size car are investigated using commercial software. Parametric analytical studies have been carried out to estimate the stiffness and fatigue life using commercial software. A new « Case Studies in Engineering Failure Analysis » online 17 June 2014, about the cracking leakage accident of deaerator/sourgas stripper cylinder in a chemical fertilizer plant. The analysis results indicated that improper welding was the main reason for the cylinder cracking failure. Chromic carbide (Cr23C6) was precipitated at partial grain boundaries of the transition region between base metal and weld seam and induced the depletion of Cr element at the grain boundary and in the vicinity of grain boundary. Cl− in the media was enriched at the grain boundary of chromium depletion region and formed pitting corrosion, which could lead to stress-corrosion cracking of cylinder under tensile stress.